A popular question on basic probability appearing in quant job interviews is the classical matching problem described in amusing forms: hats in a check-room are mixed and randomly distributed to the guests; a secretary has mixed a set of letters and their envelopes. What is the probability that no hat will match the right guest? What is the probability that exactly 3 letters will reach the right destination? Therefore, in the limit of large N the probability approaches , which is a quite surprisingly result. This result can be used to compute the probability of zero matches which is simply 1 minus the probability of at least one match. Not that accurate, but fun. 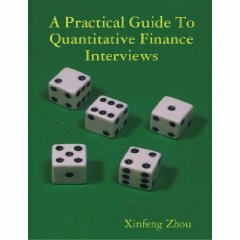 Just updated my Books page with a few lines of review about some popular “Quant job interviews” books. Well written and useful, as the other Joshi’s books. Many non-trivial questions and original solutions. Interesting and unusual the section about C++ programming.